In the August Golf Digest, Ron Whitten does an excellent job counting the number of hazards at 2015 PGA venue Whistling Straits while revisiting the whole bunker fiasco as idea behind playing all sand as a bunker. Many will not enjoy the dredging up of this unfortunate moment, but considering that Johnson is a pre-tournament favorite and the incident has never sat well with anyone registering a pulse, it won't hurt to to rehash this as we return to the Straits Course. If nothing else, the talk will serve as a public service reminder to all players to not touch any area of sand with their club before impact. There was this from Whitten's piece on DJ's odd episode, which ultimately ended up involving his brief, barely discernable pre-shot routine club grounding, not a grounding behind the ball to improve his lie. The randomness and lack of intent makes the entire thing that much more regretable. Johnson told officials he thought he was in a patch of rough trampled by the gallery. Trouble is, every patch of sand at Whistling Straits is considered a bunker. The course looks like a links in towering sand dunes along the western shoreline of Lake Michigan, but in a previous life, the site was a flat Army air base, crisscrossed by concrete roadways and runways and containing the type of bunkers in which ammunition was stored. When Dye starting transforming it, he found no pure sand on site. The soil was rocky and mostly clay--even the beach was mostly rock--so Dye had 13,126 truckloads of sand hauled in. Again, in Johnson's defense, photos taken before the Straits opened in 1998 show some of the faux dunes created by Dye were covered in sand, which had been dumped and spread in an apparent attempt to make them appear as natural sand dunes. But then tall fescue grasses overtook them, and the hillsides went from white and barren to green and wavy (golden in the fall). But in 2010, spectators' wear patterns might well have exposed some of that thin layer of sand. Player confusion might lie in the fact that this all-sand-is-a-bunker rule isn't universal. The opposite rule was applied at the 2012 PGA at Dye's Ocean Course at Kiawah Island, S.C., where nothing was considered a bunker. 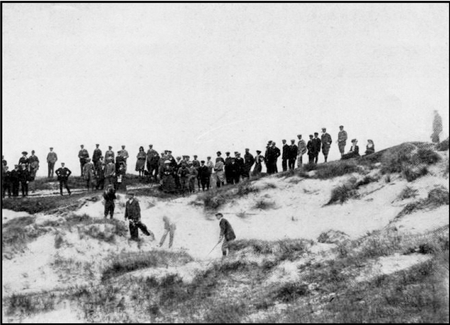 All sand was considered a "transition area," and players could ground their club anywhere. It also differs from the rule the USGA applied at last year's U.S. Open at Pinehurst No. 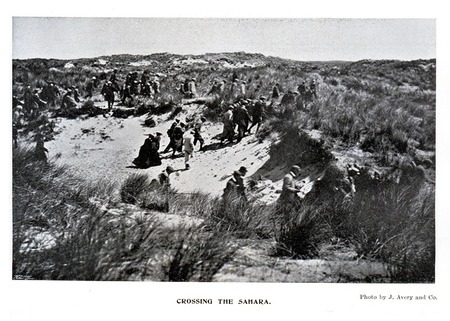 2, where only sand having rake marks was considered a bunker. 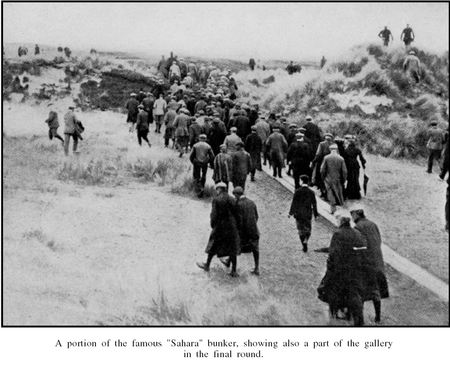 All other patches of exposed sand were treated as "through the green," and a final determination was left with the rules official accompanying each group. From the archives, if you want to relive the episode, there was this post on intent that might be worth a minute of your time. And this from Pete Dye, who would have none of it when talking about Johnson not recognizing he was in a bunker. "I was standing right there," Dye said. "When he hit the ball in the bunker, the referee walked up to him and said, 'Do you need anything?' and Dustin said, 'No, I'm good.' There were no beer cans in the bunker, there were no chicken bones in there. Ray Charles could have seen it was a bunker." The CBS coverage from back then showing the "split second" grounding, as Nick Faldo called it. Feherty's return to the bunker after the episode is telling in how (A) many people didn't understand the local rule (B) and how much he felt for Johnson in trying to ID the bunker as a bunker. Five years later, it seems as if this episode ultimately still feels unresolved because the rule seems so contrary to the spirit of the game, especially since it was so clear that the situation was frenetic, uncontrolled and carrying such hugh ramifications. "Ray Charles could have seen it was a bunker." Thanks to Brooks for spotting Gary D'Amato's short post after running into Pete Dye at the new French Lick Resort where the octegenarian architect was still talking about Dustin Johnson. "It was kind of a freak thing and unfortunate. But it happened.﻿"
"Although golf's ruling bodies should constantly look at every aspect of the game, a ball that flies 20 yards less is not what the game needs right now." “I have quit plenty of times but never have I faked an injury and the guys here know it." “All I know is I’ve never ever faked an injury on this tour,” the two-time major winner told Reuters after shooting a two-under-par 68 at the Wyndham Championship on Thursday that left him seven strokes off the pace. Yes, they know you're a quitter alright! "I think it's a stupid rule." Scott Michaux tracks down Roberto de Vicenzo to talk about the Dustin Johnson boondoggle and you can't help but sense chaos played a role in both sad days for the game. "The four biggest events in golf are too important to be compromised to the extent that last week was." I'm not sure if this speaks to a general disdain for the rules or maybe just the power of ESPN.com, but as happened during the last freakish golf story (Tiger and his women), an item about the Dustin Johnson violation has landed in my email box in three different chain email forwards in the last two days. The text does not include a byline, but unlike in the Tiger case, this one is real and it can't be spoofed because we know the incident was already teetering on the edge of farcical. "DJ took about four minutes from the time he arrived to the scene to the second he made contact with it." Stephanie Wei interviews photographer Allan Henry, who could be seen in several images directly behind Dustin Johnson when he violated the rules in the 18th hole bunker. Henry says Johnson never grounded his club on his practice swings and also notes this, which might be of interest to those who think Johnson rushed the shot. Another PGA Question: Who Wants To Return To Whistling Straits? And the player comments haven't exactly been glowing. Not that this means anything. After all, we know that complaints about a course can often be a compliment to the architecture. But after another four rounds at WS, I'm not sensing it really is worthy of a return visit. Yet a 2015 return date looms and a few days removed from the PGA, I've had the pleasure of listening to several phone rants from folks who found the entire week to be one they'd like to forget. It's Come To This: David Price Receiving "Hate mail and nasty calls"
"As good as he is, as much work as he put in, the stuff he was working on couldn't have been right, or it would have worked better." Jaime Diaz analyzes Tiger and Sean Foley's flirtation game. Doug Ferguson catches up with Dustin Johnson taking it easy after the PGA and notes that he was the first player to play in the final group of two majors in a season since Ernie Els (2004), Phil Mickelson (2001) and David Duval (2000). While I understand the rule in question and the violation by Johnson, why isn't intent allowed to play a role here? After all, the only reason we know about this incident is because it happened on camera. The walking rules official did not see the violation happen and Johnson was not going to call a penalty on himself because he didn't realize he committed one. Had this happened Thursday off camera, no penalty would likely have been incurred. So since we have the addition of cameras, tape and viewers calling in, leading to penalties like this, shouldn't the rules also allow for that tape to take intent into account? It seems that precedent has already been set with the statements in the McIlroy and Perry episodes? No? Rules gurus, please set me straight! **There's a nice response from John Vander Borght on his blog to the intent question. It was only a matter of time. Hey, times are tough here. Click on image to enlarge. While the below images show fans in bunkers during tournament play, none were as on top of players and masking bunker boundaries as what happened with Dustin Johnson. From Rob Matre, Tiger in 2008 at Torrey Pines. And from the old magazines, courtesy of the art department. So much for Germans dancing in the streets over Martin Kaymer's PGA Championship win. Reader Lloyd emailed a friend in Germany and shared his exchange. Did anyone in Germany watch or notice? but dirk read about it in the newspaper. just a small notice. Reader David Foster brings up the next logical question in the post Dustin Johnson club grounding debate: "Why do we have bunkers at all? Let's get rid of them all together."